Note: I use the term dead rather than late or passed away. Late implies he’s on his way, he’ll be here soon and he’ll come back, which is untrue. Passed away is so soft, like the leaves blowing in the wind. The loss of my father was far from soft; he was the pillar of my family and when he died my world came crashing down. My father died on April 1, 2011. I miss you. Still. In a different way each day, every year. I didn’t know there were so many ways to miss one single person. But there are so many ways to love, it only makes sense. I miss you, I miss you, I miss you. As much as I miss you I’m still angry. This is part of the grief, or so I’ve been told over and over. I’m angry at the blood disease that took you. I’m angry that the doctors found a cure after you died. I’m angry you didn’t prepare me to live without you. As much as I hate the disease that stole you from me, I have to be thankful for the blood transfusions that held the disease. This blood gave you life when you were fading, your life resulted in me. You live in three amazing children in this world – something I can never be angry about. I’m so thankful you choose to fight, not only after the first surgery in your twenties but after the countless surgeries thereafter. That you choose to fight to be around for me growing up, that you fought to walk my sister down the aisle and hold her first born son. I’m thankful the disease took away your ability to work a full-time job, giving you to us, your family, every single day for 19 years as a stay at home dad. I’m thankful it slowed you down, that you walked with me, held my hand and looked me in the eyes when I spoke. I’m thankful that it taught me about patience, about loving through action and the strength I would need to get through loosing you. I have too many memories sitting beside you in the hospital, but all of them have you pulling a smile through the pain, no matter what. I’m so thankful you taught me how to be resilient. I’m thankful the doctors now have a treatment and a cure. I will always fight the taste of jealously for all those families who didn’t bury their loved ones. But that jealously Is washed away knowing less people will feel the loss I have felt. Less people will see how organ failure is a slow, painful way to go. Less people will have an anniversary marked on their calendar for loss and not love. I replay our last days together so often; I still can’t remember our last words but for my sanity I have to believe it was ‘I love you’. I’m thankful I wasn’t able to go back to Toronto that weekend and I got an extra day with you. I’m thankful we did our normal trip to the next town to get groceries and walk around. I’m thankful we stood in the kitchen hugging while breakfast cooked. My ear on your chest, where it hallowed out so I could hear your voice and heartbeat at the same level. Your arms wrapped around me, protecting me from the world and the impending pain I didn’t know was coming. This moment is my security, my safe place. I often envision us together, in the kitchen of the house we built as a family, with the barns and horses outside the window and trees as far as the eye could see. I often run back here when life is hard, when the weight of not having you is too much and when I want to be a child again. This was my last moment as a child. I know you knew, you knew that your days were few and that you started to give up. I don’t blame you – I never could. You fought for more than half of your life, lived with an invisible illness and were still the warmest, most loving man many people knew. But why didn’t you tell me? Why didn’t you warn me just once – a simple whisper in my ear that you would be with me no matter what? There was no goodbye, no words of advice or one last sentence to hold onto for years to come. A week or two after you died I was cleaning your dresser and organizing your things. I found the fathers day card I made for you when I was sixteen. You kept it which was such a surprise to me – I was no artist and all it offered was breakfast on me at our favourite truck stop. 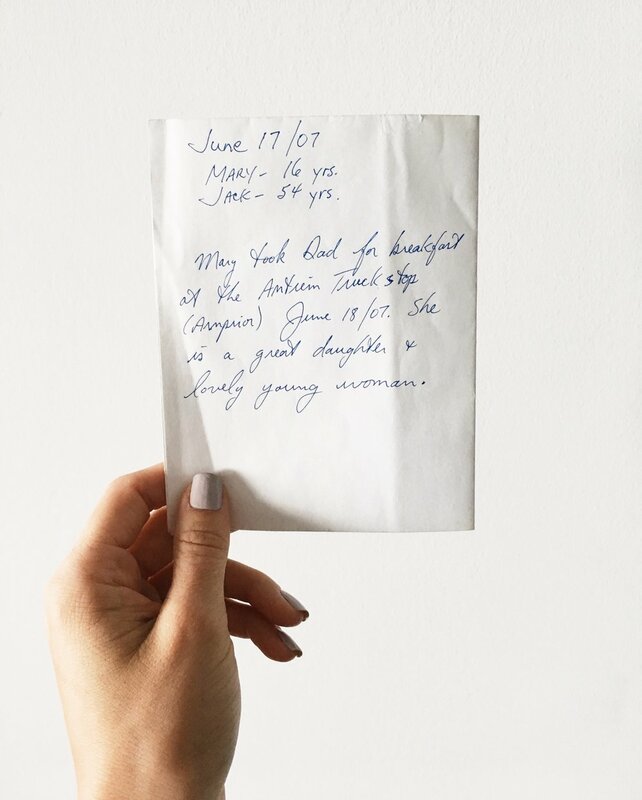 I flipped it over and saw a note you wrote – maybe with the intention I would see it one day but likely for you to hold onto. This card means the world to me. Your writing and thoughtfulness to even keep this mean the world to me. I have it framed and kept beside my bed to keep you close to me. Thank you for teaching me to love, to listen, to be patient, to be bold, to be strong and most importantly, to be resilient. Life is never what we plan or what we expect, but life is always worth fighting for and living.